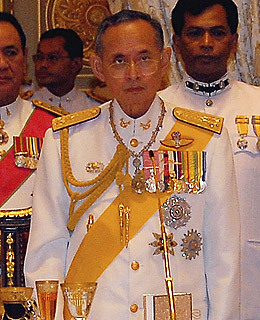 Time magazine has nominated King Bhumibol Adulyadej as one of its 100 most influential people for 2007. The magazine said Bhumibol is viewed as a virtual god within the country and is the longest reigning monarch in the world. The Time website allows users to choose which of the 204 nominees they believe should make the final list. Bhumibol is currently in second place on the list with 287,576 votes. He trails South Korean pop star Rain, who netziens - most likely trigger-happy Korean netziens - believe to be the most influential person in the world.